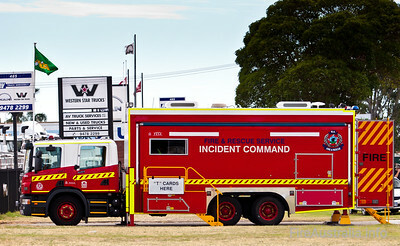 WA Fire & Rescue run one Incident Control Vehicle (ICV) in the Perth Metro area. The main role of the ICV is to enable communication, command and control at large scale incidents. 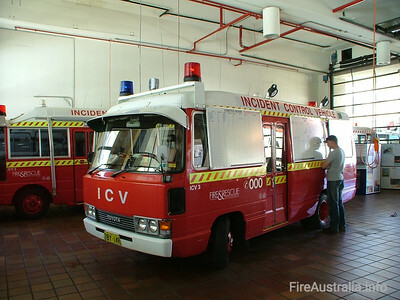 ICVs are equipped with Radios and other communications equipment such as facsimile, mobile telephone and data/internet capabilities to enable connectivity with the Communications Centre, and with crews at the incident. 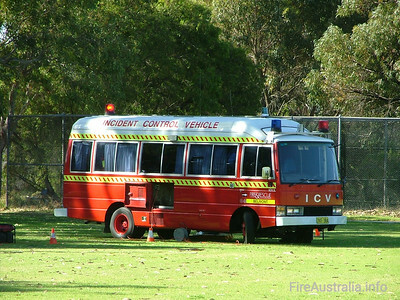 The ICV is also a location for the Incident Controller (IC) and Incident Management Team (IMT) to operate from. Earlier models predominantly provided communications terminals and a small workspace internally, and carried awnings or tents to establish a larger working area outside the vehicle. The latest ICV for FRSWA saw a major upgrade, featuring a custom made body on a Scania Crew Cab Chassis. The ICV features a slide out section, which increases the internal workspace. The internal space provides separate communications and IMT space. A dedicated stairway and window enables the separation of crews reporting to the ICV from the IMT operations, reducing distraction and clutter. ICV5: Scania P310 Crew Cab, with Purpose Built rear Body section.